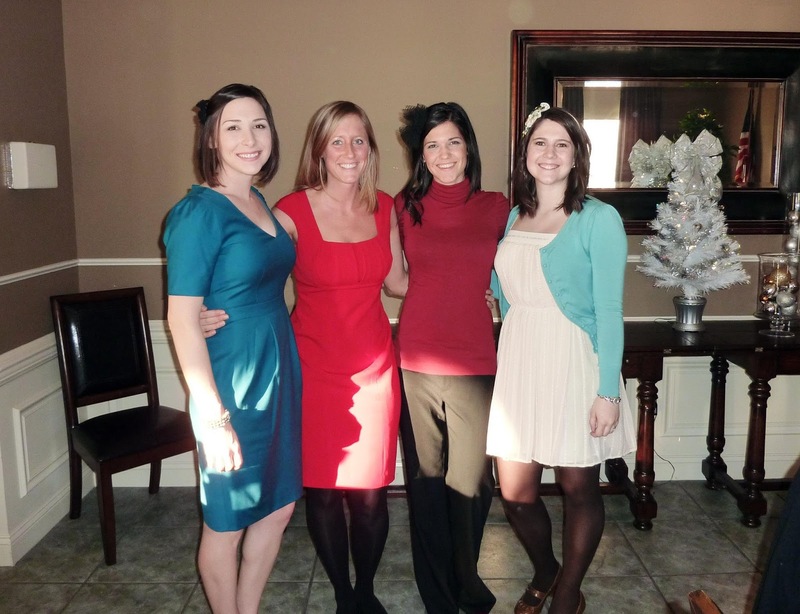 Saturday was the Law Wives Christmas Tea! It has always been my favorite event, since December of 2011. I won a teapot for being the first to finish a crossword, and I immediately knew it would be the event I looked most forward to every year. Look out, future law women -- I may just appear without invite in the years to come. Since it was my last one, I had a lot of excitement and expectation built up for it. This year was a bit different, because a lot of friends had graduated and left the law wives. I was still looking forward to it because I love tea, and I drink an exorbitant amount of it at these things...my friend Stephanie and I always joke (although it's more like a tease, because it's real) that we're shaking by the time the tea is over. The great news is that Stephanie was able to make a valuable guest appearance as an experienced alumnus! She spoke on the history of tea, and was able to enjoy the afternoon with us. The mediocre news is that the tea was sub-par this year. Don't get me wrong, there were still treats and a lot of ladies came and it was a very sweet afternoon. The problems, for me, were in the tea itself -- the school's catering company did the honors of providing everything for us, and we had plain white dishes and a simple carafe of hot water with a basket of tea bags. That doesn't sound half bad, but when you compare it to the last two years when we had tables decorated with mixed vintage teapots and teacups and saucers and little silver stirring spoons and fresh flowers, and were served each traditional course and were provided with fresh pots of hot ready-made tea when we began to get low, it seems like a real step down. I feel really snooty just saying all of this, but it really was a letdown when you have to make each separate cup of tea with a tiny carafe of hot water that ran out quickly and still had the aftertaste of old coffee. We played a few word games and had Stephanie speak on the history of afternoon tea, and we also spoke a bit about the Godparent Home which is kind of our focused project for each Christmas tea. The Godparent Home is a ministry here on campus for young pregnant women/teenagers who have chosen life, and are planning to have and raise their children or give them up for adoption. Each year we collect spa items for these girls, filling stockings and bringing them over and having a spa night with them. I always love the game portion. There's nothing more stressful and exciting than a room full of people who are completely silent, trying to find that dang "lemonslice" entry in the timed word finder. We also had a "best dressed" category for a prize this year, since people had fun dressing up last year and we wanted to encourage people to go all out! Overall, it was a great group of girls and I still felt like crying a little once it was all over. I also have been making pots of tea in that teapot I won the first year, both to be nostalgic and because I'm way behind on my normal tea intake for this time of year.